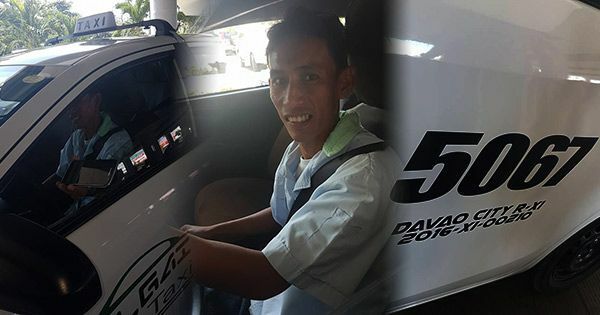 Despite his financial hardships, an honest taxi driver in Davao returned the cellular phone left by a foreigner on the passenger's seat. His story has gone viral on Facebook. According to the foreigner's Filipina wife, Mae Phelps, her husband forgot his cellphone inside a taxi when they went to SM Lanang Premier, one of the biggest malls in the city, last Monday, August 29. At first she thought her hubby left his phone at home but he insisted that he brought it with him. He even remembered placing it on his lap while riding the cab. The wife said she immediately purchased a load and dialed her husband's number. Mae said her first 4 calls were cancelled, but the receiver answered it the fifth time around. The driver, who went to the the police regional office to turn the item over, apologized for cancelling her calls saying he doesn't know how to use the phone. He promised to return it right away. Five minutes later, Mae got hold of her husband's phone. She wanted to give the taxi driver a reward but he refused to accept it. A certain Inday There commented on Mae's post and said she knows the identity of the driver, Bryan Paica. The netizen said she is proud of Bryan because he did not take advantage even though his family is poor. According to her, Bryan's father is blind and unable to walk, his mother is also sickly and both need financial help. This honest taxi driver deserves a reward, don't you think?